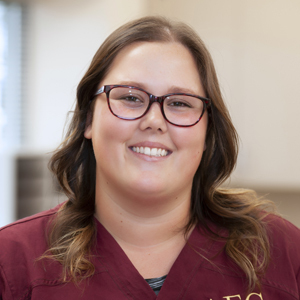 Leah joined AEC as a Licensed Veterinary Technician (LVT) in 2017. She graduated from the Macomb Community College Veterinary Technician program in 2013 with an Associate of Applied Sciences (Veterinary Technology). Leah had over 5 years of general veterinary practice experience before beginning emergency work at AEC. "The thing I enjoy most is providing care to my patients, especially those admitted to the hospital. I also enjoy when my patients are able to return home to their owners and I have an opporuntity to help educate them on their pets recovery and care." Leah has a special interest in continuing education. When she isn't working she keeps busy with her 7 year old rescue dog, Mira, and 3 year old cat, Morley. In her spare time Leah enjoys hiking, camping and reading.